My first full day in Singapore! I was super excited to be a tourist in the country I would call home until December. My mom flew to Singapore with me to make sure I got settled and also to do some touring with me. She had been to Singapore before, but in 1989. The country was drastically different then. My favorite places, Marina Bay and Gardens by the Bay did not exist. However, the famous Merlion did stand in 1989 and that’s where we were heading after seeing Singapore’s resort island, Sentosa. It was a normal day to us tourists, but what we did not know until later was that Singapore was getting ready to celebrate 50 years of independence. On this particular day that we decided to visit Merlion park (August 1st), a practice ceremony was taking place for August 9th, Independence Day. I had never heard of a country having a practice ceremony for their Independence Day ceremony, but Singapore was and they went all out. 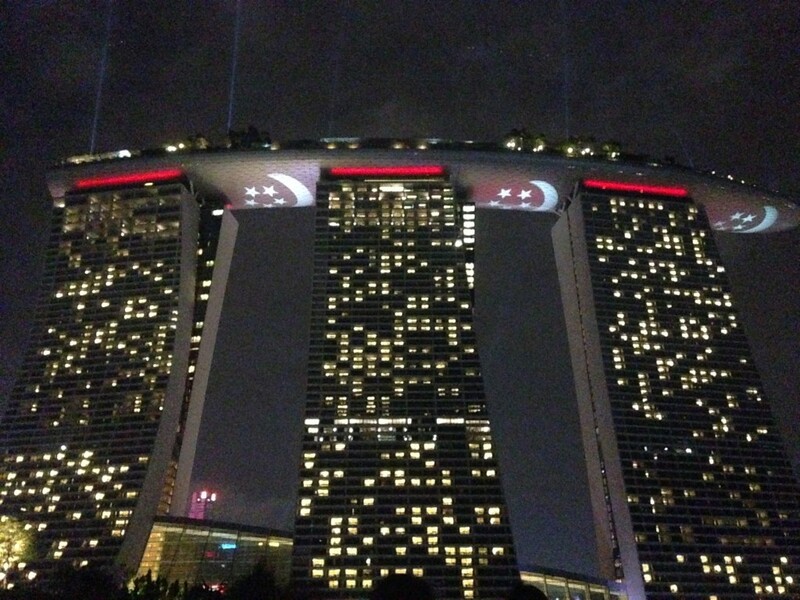 Marina Bay Sands! The balloon in the photo is the number 1. These balloons were all around Marina Bay of the numbers 1-50 to commemorate the 50 year anniversary Singapore was about to celebrate. To our dismay, the Merlion was blocked off because there were already too many people in the area to watch the ceremony. My mom and I had no idea why there were so many people all around Marina Bay and Google didn’t help us much either. On a whim, we decided to stay to see what the fuss was all about. I wasn’t kidding when I said there were a lot of people! My mom and I got to enjoy the Merlion from a distance. 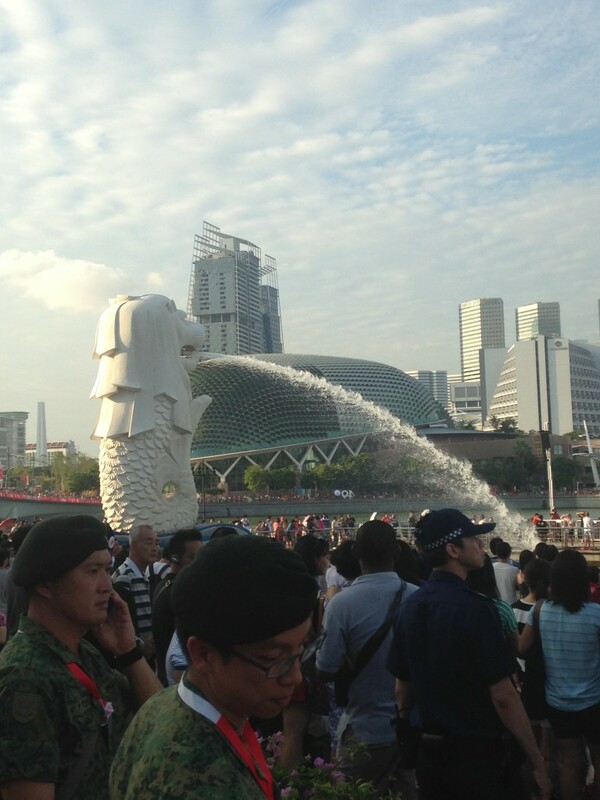 If you look closely behind the Merlion you can see the crowds of people gathered all around the Bay. Staying turned out to be a great idea because an air show started and it was amazing. 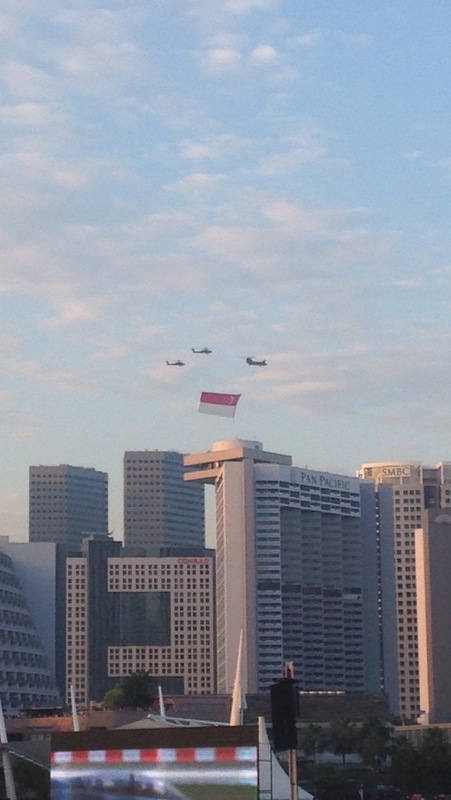 Singapore’s flag being flown across Marina Bay. 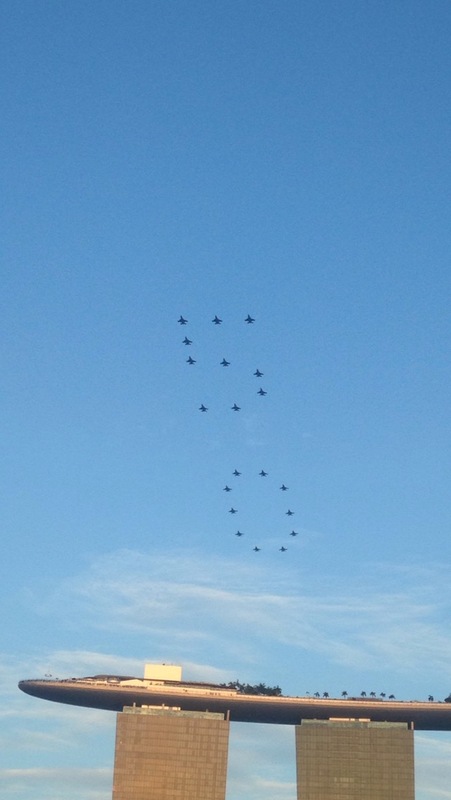 Perfect formation! Still cannot believe everything was performed all out like this just for the practice ceremony. After the air show a parade began on the other side of Marina Bay. We couldn’t see the parade directly, but there was a large screen displaying the whole show for us. The parade was amazing. I really got a sense of the culture and the people. 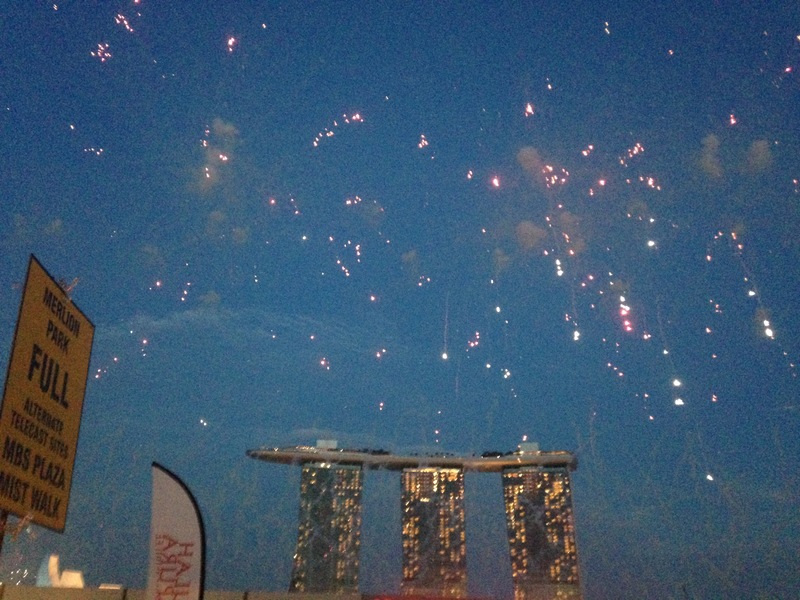 During the parade the sun started to set and I discovered that Marina Bay is just as stunning at night. Of course there were fireworks! I got to watch them with MBS as the background. Truly amazing! I had no idea this was only the practice round. A theme throughout the ceremony was “Majulah Singapura” which is Malay for “onward Singapore.” There was a strong sense of nationality in the whole parade. Mini-presentations during the parade highlighted the need for Singaporeans to band together to create the best society possible and continue onward to bigger and better things. The population in Singapore is mostly Chinese, then Malay, Tamil, and others. The mini-presentations focused on the fact that Singapore does not belong to the Chinese, Malay, or Tamil people. Singapore belongs to all of these groups equally and it is possible to co-exist peacefully. I thought this message was pretty important. Post fireworks, my mom and I decided to check out Gardens by the Bay which became my absolute favorite place in Singapore. 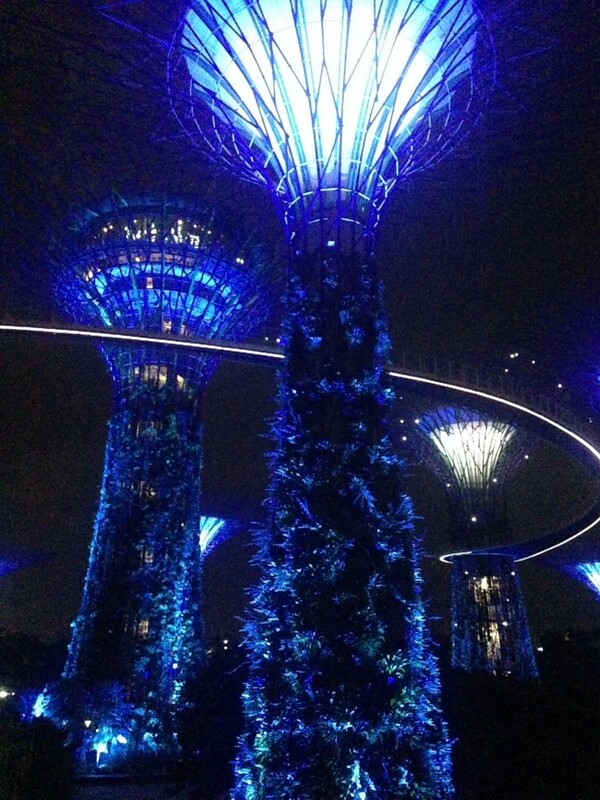 The supertrees are mesmerizing and have an “Avatar” look to them. I felt so at peace in the Gardens probably due to the ambient glow of the supertrees. My jaw hit the floor. So beautiful! The Gardens are on the other side of Marina Bay. So opposite where I watched the fireworks from. 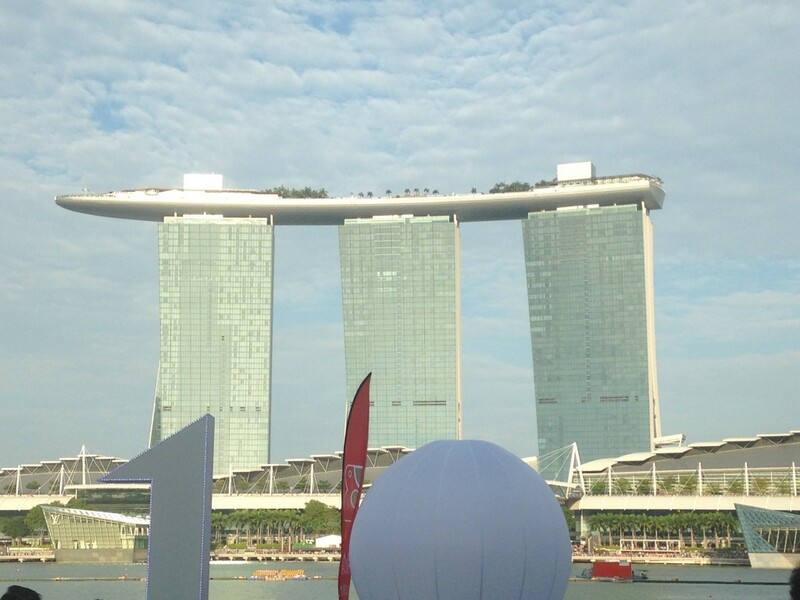 I got this close up shot of MBS from the other side. Check out the symbols projected on the underside. This symbol is on Singapore’s flag. After visiting the Gardens my mom and I walked back to Merlion park. By now most people had cleared out so we were able to get up close to the Merlion. 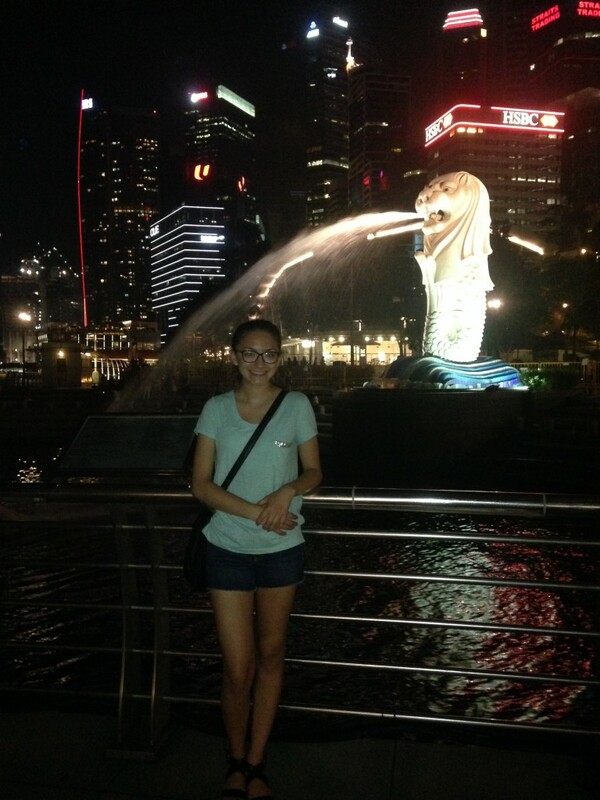 Me standing in front of the Merlion. Really excited to live in Singapore until December! I am proud to chalk this day up in my top five best days ever. 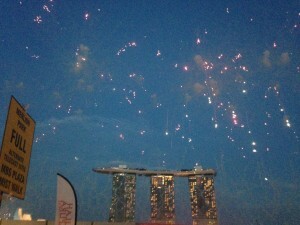 Happy 50th Singapore! ← Extended Spring Break Deadlines!